Curious about what Anna comes up with for Vogue’s next cover, I discovered, much to my surprise, that it was a model! And that’s a noble, yet rare thing to do, Anna! I know you heard this before, and you’ve even heard it from me, still, I feel compelled to repeat myself: Gisele has that mummy look she never had before. Yep, mothers do have something special in their look. Especially in their early mothers life! That brings something new to old Gisele, too bad it’s not Anna’s contribution. What irks me about this Gisele’s Earth Mother story is the sanctification of Gisele’s persona. Suddenly she’s more than a model. She’s a Na’vi! How uninspired and entertainment-submerged must be the person who wrote the article as to talk about a real life person in computer-sci-fi generated terms? From all the world’s vocabulary, it had to be Na’vi? (for those of you who are not yet familiarized with the concept and the visuals, Na’vi is the computer generated population from the planet Pandora, also fruit of Avatar’s scenarists imagination!) 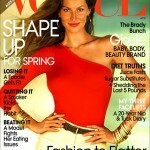 I admire Gisele and feel the righteousness of her covering Vogue’s Shape issue. Then again, if we’re to relate to shape issues, why bring on a goddess to make us all feel puny and irrelevant? Especially all those young mothers who look nothing near Gisele only four months after giving birth? 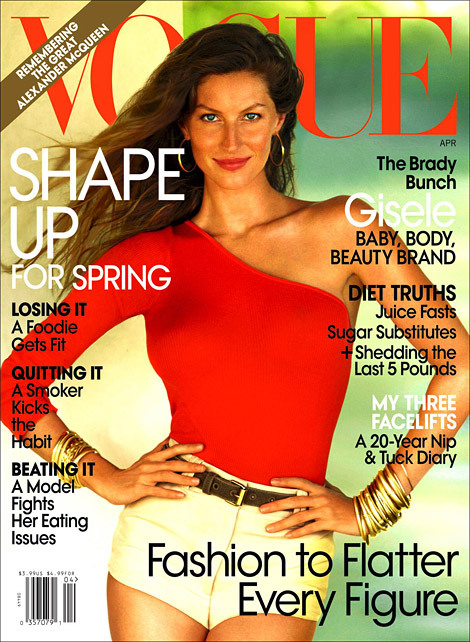 Again it is nice to see a model on the cover of Vogue, any Vogue for that matter, but Gisele has never interested nor inspired me, and sorry Kpriss just because she has given birth it does not make her special. Children are the special ones not really motherhood for they can be a wonderful gift and joy to all, whether they are parents or not. She looks awful,i never liked her,she doesn’t express anything,but an extra tanned girl. It is always a relief to see a model, any model on the cover of a fashion magazine & Giselle knows how to look great – that is for sure! I hope it continues I would love to see Daria on the cover next month. Forgot something. This Vogue is an interesting issue. It contains Kim Noorda’s weight struggle diary. “Beating It – A Model Fights Her Eating Issues”. I’ve read a piece off it and that was a heartbreaking read. Hopefully this is a groundbreaking way to another view in fashion on the body image that Anna wants to achieve with Kim’s diary in the issue! And with that curvy, looking Gisele on the cover? Please let it be so….. I say that the “glow” is not always there and I don’t think it special or makes someone special. I have several friends who are pregnant, have been, my best friend just gave birth. I would not say that she has or had a glow though. I just find it to be this a cliche revelation. Some women suit being pregnant and carry wonderfully well and some women do not, it does not mean that the ones who suit it are or will be better parents. And what of the women who do not breastfeed Kpriss are they sans glow? I honestly think that the glow you are seeing is an aura of love. I have seen this in aunts, uncles, grandparents, and people who love the child. This aura of love can happen with adopted children too. Thanks for sharing your insight on this though. Ellington, hmm……I’ve not to think long about it to say: “that is so very true!! !” The aura of love (that sounds really wonderful btw!) shows in all sorts of love. Adriana, this “glow” is called photoshop. No Ellington,i do not suffer ! The point is, that there are real beautiful women out there,and i don’t think Gisele is one of them ! Mark, you don’t understand what some of us feel this “glow” is. Everything is photoshopped. What’s new? But not the look in her eyes neither her smile! Diane, you can say what you feel about Gisele for good or ill. I was just remarking on how weak your comment was in regards that you accused everyone else of being jealous and suffering for not “adoring” Megan Fox as you seem to do. No I do not think that you are suffering or jealous of Gisele, at least I hope not, but I do hope that you see just how jank it is to accuse someone of being jealous just because they do not care for someone or something that you like. I also find Gisele more attractive that Megan Fox. More LOLs: I think it’s so manly to like Megan not Gisele. No correction: Megan is probably very attractive for boys in their puberty! (Sorry, Ellington and others….can’t help myself! LOL! I’m not a man either. It’s Adriana. Sorry to disappoint your non sequitur reasoning Diane (really what does my gender have to do with what I said to you and your suggesting that everyone who does not care for Megan Fox is jealous?). I am as Adriana said all woman and very straight for the record. Can anyone tell me how the current black leather/pleather jacket look came about? They’re in stores across Australasia right now along with the still-popular grunge/tartan shirts. Did one of the designers do a biker line or something? Has that look ever been out then? I always wear on and off black leather and/or (grunge) tartan shirts? Tartan shirts have always been around. They call them grunge since the 90’s due to the grunge scene. I can’t remember a collection with a biker line. I wonder if Terry Richardson is to blame! doesn’t he make you wonder if he ever changed his wardrobe from the 90s? when those tartan shirts were big hits? (not to bring the subject around Terry and his sleazy ways, it just crossed my mind and I thought it was funny). Yes, it’s Spring and I wore a leather cap etc. and that was too hot. LOL! No, not because of that sleazy Terry Richardson who causes quite some noise of late. Is he a fashion photographer or isn’t he? To me he’s a soft-p*rn photographer. I hate his photos. I’m open minded towards p*rn: each to their own. But to (ab)use it as arty-fartsy fashion photography with very young models? Ugh!! To end a bit happy and sunny: I’m gonna look to tomorrow in town for some summery clothing and new summer shoes. Definitely not clogs, no way! I remember Marc Jacobs doing a biker/grunge line a while ago. Ellington, I feel “so hot” since I’ve learnt that vinyl is THE thing again. I’ve so many LP’s in boxes. LOL! But to be honest: I’ve always missed the beautiful covers. I’ve some framed on wall. They were cool because they were so great to read the lyrics along and some were almost art. Yes album art is missed and you cannot get the same feeling from a cd jewel case and certainly not from a download. Framing some of the covers is a nice touch.